The life of a recipe developer can be odd. I might be working on fried calamari at 7am in the morning, chocolate cake at lunchtime and researching Dragon Fruit around dinnertime. But I cannot complain because my life is literally delicious! 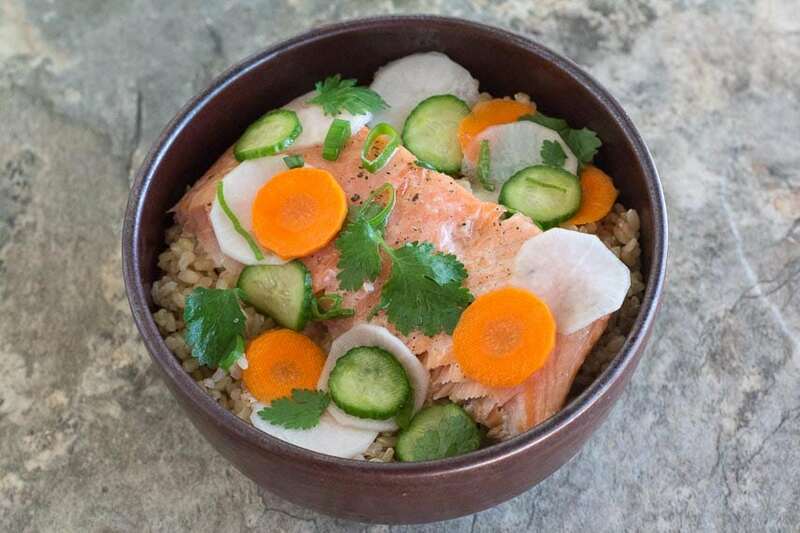 This recipe for Low FODMAP Salmon Brown Rice Nourish Bowl with Quick Pickles came about when I needed something light and healthy and nourishing – and easy enough for a weeknight (to balance out the chocolate cake lunch). It was inspired by a version from Bon Appetit magazine, my old haunt. On the Monash University Low FODMAP Diet Smartphone App you will notice that pickles appear in a few places and in a few forms such as Gherkins in Vinegar (3 cucumbers (75 g) are low FODMAP), Artichokes Pickled In Oil (10 g are low FODMAP), Pickled Beetroot (2/3 cup 75 g is low FODMAP), Pickled Onions, Large (2 onions, 45 g are low FODMAP) and more. But what about pickling at home? First of all, many purchased pickle products (a tongue twister!) contain garlic and/or onion as do many recipes for home preparation. The quick pickles in this recipe are super simple – no canning or boiling of jars required. Here I am calling for carrot, daikon and cucumber for a mixed pickle. 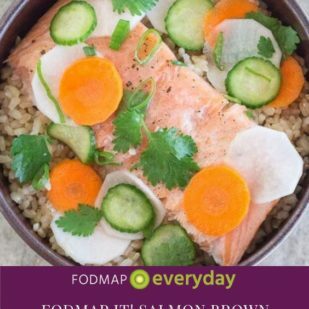 You get the color, texture and flavor of all of these low FODMAP vegetables in one easy dish. 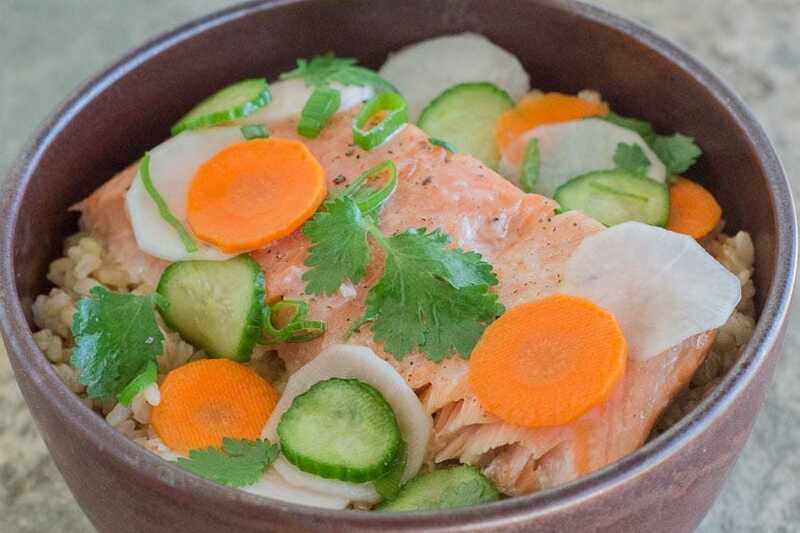 While they complement the salmon in this nourish bowl perfectly, this recipe makes a larger batch of pickles than you need because you WILL want to eat them the next day and the next and the next! All with very few ingredients – all easy to shop for, too. Most of the garlic-infused oil found commercially prepared is based upon olive oil, and while we love olive oil, when it comes to our Asian and Mexican inspired dishes we prefer our garlic to be infused in a more neutral-flavored vegetable oil. You can make your own, of course using our Garlic-Infused Oil recipe or if you are looking for one to purchase we love the quality and flavor of Tourangelle. Check it out! This FODMAP IT! 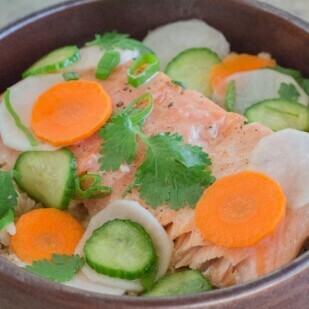 Salmon Brown Rice Nourish Bowl with Quick Pickles is easy to make, light and healthy. Perfect for a dinner when you want to feel nourished. Position rack in middle of oven. Preheat oven to 250°F/121°C. Line a sheet pan with parchment paper for easy cleanup. Place thinly sliced veggies in a non-reactive colander set in the sink and sprinkle with 2 teaspoons of kosher salt, making sure they are evenly salted (I like to massage the salt in with my hands). Allow to sit for 20 minutes while oven preheats and you begin to cook salmon. Meanwhile, place the salmon skin side down on prepared sheet pan. Brush with about 2 tablespoons of the oil and season with salt and pepper. Slow roast for about 20 minutes or until just cooked through. While salmon is cooking, whisk together the vinegar, sugar, salt and pepper in a non-reactive bowl until sugar dissolves. Add the vegetables, remaining oil, scallions and cilantro and stir together well. Allow to sit while salmon is in the oven. 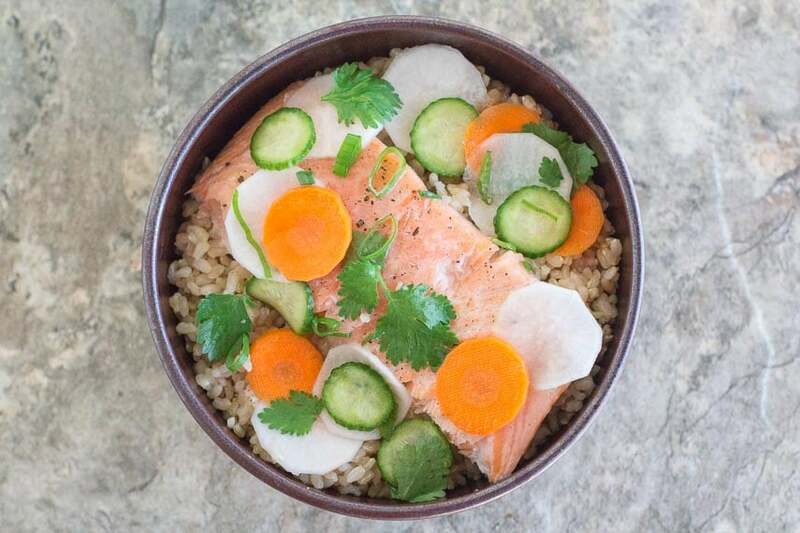 When salmon is done serve with hot brown rice and quick pickles. Extra pickles can be refrigerated for up to 3 days in an airtight container.